Home Supply Chain Management	The Cloud – What’s in it for supply chain managers? The Cloud – What’s in it for supply chain managers? Cloud computing, often referred to as “the cloud,” is the delivery of computing resources (e.g. servers, applications, storage) on-demand over the internet on a pay-for-use basis. There are three types of cloud computing services: Software as a Service (SaaS), Platform as a Service (PaaS) and Infrastructure as a Service (IaaS). A company could be using a public, private or a hybrid cloud. The hybrid cloud combines the foundation of the private cloud with the strategic use of public cloud services. The concept of cloud computing has been around for about 20 years, however, it has not yet been widely accepted in the supply chain field. There are a number of advantages which prove that moving to the cloud could improve supply chain processes, however, certain risks have to be taken into consideration. In times of high volatility in financial markets, as well as in supply chains, finding a way to be responsive and predict possible supply chain disruptions is a key competitive advantage. The cloud offers a responsive technical platform for so-called supply chain control towers, which have three levels. The first level consists of an integrated transactional system with dashboards, real-time visibility and alarms which go off when an issue occurs. The second level is used for analysis of the data, in order to identify the root cause, risks, make “what if” simulations and find the right response to each situation. Finally, the third level helps users make executive decisions, improve KPIs and get management insights. Cloud computing provides companies with an ability to swiftly adapt to unpredicted changes and disruptions. This is made possible by enabling data to flow throughout the whole organization, facilitating more convenient and smooth communication between different departments and business functions. The cloud also helps with end-to-end visibility of the whole business and enables real-time collaboration of different parts of the supply chain. It helps the supply chain become more secure, dynamic and interactive. The cloud also provides a high level of flexibility. A company is able to quickly adjust to changes in customer demand and target specific niche markets, customers or segments. The cloud is typically used on a pay-for-use basis, which means scaling down or up according to fluctuations in market conditions does not cost the company a fortune or require a significant investment. Effortless supply chain process scalability means that a high level of efficiency is reached by integrating people, technology and processes. By adopting cloud computing, companies are able to enjoy all the aforementioned benefits without making substantial upfront investments. Costs are minimized while the management of software is made easier. The incurred configuration and integration costs can be transferred into operating costs. There is also no long-term commitment that needs to be made in order to move supply chain processes to the cloud. This can be especially beneficial for small and medium sized companies, which do not have extensive resources, but want to build their competencies to secure a strong position in the market. There are a number of risks and challenges which need to be considered before moving supply chain processes to the cloud. Firstly, not all supply chain strategies are equally cloud-friendly. The four most cloud-friendly strategies are: sales & operations planning (S&OP), spare parts management, store shelf optimization and transportation management systems (TMS). Using the cloud to implement these strategies has the greatest potential to create the network effect throughout a supply chain. Graph 1 shows a relationship between the network effect and the sensitivity of data sharing. 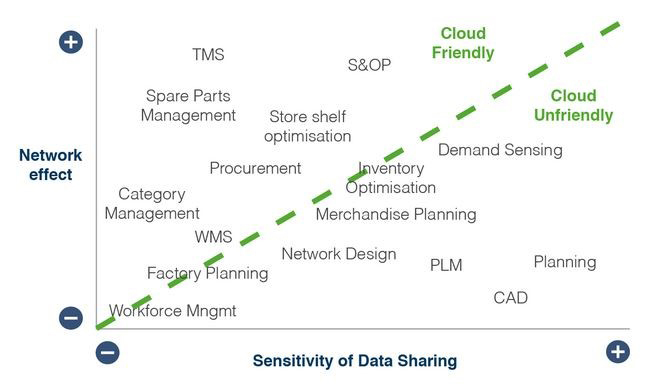 As seen on the graph, some supply chain strategies are more cloud-friendly than others. Consequently, it is important to evaluate the company’s main supply chain processes, and weigh all the advantages and disadvantages before moving to the cloud. Another important aspect to keep in mind is the fact that innovation cannot move faster than the customer. Regardless of the extensive list of benefits the cloud could bring to a company, it will not be implemented if it is not accepted and understood. An often cited reason for not adopting cloud technology is the lack of management support. Poor support comes from the lack of understanding of the new technology and the benefits it might deliver throughout the supply chain. In addition, some cloud services are quite rigid and allow very little customization to be made. Some cloud service providers do not provide full database access to their clients. Internal IT teams, which are used to being in control, might feel threatened and resist the implementation of the cloud. Lack of access to the full database might seem frightening to management teams, which are primarily concerned about the security of their company’s data. It is essential to help management and IT teams understand cloud computing before implementing it. Who’s already in the Cloud? Quite a few successful examples of cloud computing in supply chain management can be found in the pharmaceutical industry. One of the examples is Pfizer. In 2012, Pfizer moved its supply chain operations into the cloud, which took 18-months to complete. The supply chain initiative required the company’s 500 suppliers to implement a cloud-based common-information-exchange framework on which each supplier was depicted as a node on a virtual supply chain. In this way, even if the size or shape of the network changes after a supplier leaves or a new supplier joins in, supply chain disruptions can be avoided due to the cloud’s ability to make the changes swiftly. The cloud helps people involved in different parts of Pfizer’s supply chain gain access to centralized data regarding shipments and the location of products, which significantly improves the speed of services. According to Pfizer’s vice president, Jim Cafone, moving to the cloud helped make the supply chain much faster when responding to unexpected events and everyday market pressures. The new shipments’ traceability helps the company expand to global markets, where Pfizer and other pharmaceutical companies ‘were flying blind’ before moving to the cloud. Another more recent example can be seen in the retail sector. UK fashion retailer Paul Smith has recently announced it has implemented a cloud based, omni-channel solution to accommodate its plans of global expansion. According to Paul Smith’s IT manager, Lee Bingham, the new cloud based software will be an essential part of the merchandising, supply chain and multichannel environment the retailer is operating in. The move to the cloud will be finished by mid-2015. By then, all Paul Smith stores will have a global real-time overview of sales and stocks. In addition, the company will have tools to help with replenishment, customer service, stock transfers and sales reporting. It is expected that the project will result in a closer integration between different channels, more efficient supply chain processes and improved customer analytics. The list of advantages and challenges mentioned here is just the tip of an iceberg. The amount of information and analyses of cloud computing in supply chains is enormous. One thing is clear- before companies decide to implement the cloud in their supply chains, thorough research should be conducted as it helps the decision makers understand why and how the new technology can benefit their businesses. Implementation without understanding might cause resistance from within the company and a move to the cloud could prove to be counterproductive. Good article what I have done is implemented a Demand driven and Consumption driven Replenishment solution and Decussion Suppprt System for Replenishment of finished goods to market demand and for replenishment of raw and packing materials to plant consumption. This model is far superior then forcasting. Niwbplabts produce to replenish sand from warehouses and warehouses dispatch to replenish demand at Retail. Also Vendors replenish to consumption at plant. This way a pharma org produces only those SKUs that are on demand and does not produce for inventory pile up – which results in slow movers and near expriry stocks. The inventory this way is fresh – much near to date of manufacturing. Also all resources are better utilized for meeting markwt demnd then just create inventory which is not needed now – specially life saving drugs. This system is in active use at very large pharma units and entire organization had moved away from forecasting to demand driven Replenishment – a clod based solution. Pls contact me at – konfluence@gmail.com for details .